results = bayesopt(fun,vars) attempts to find values of vars that minimize fun(vars). results = bayesopt(fun,vars,Name,Value) modifies the optimization process according to the Name,Value arguments. This example shows how to create a BayesianOptimization object by using bayesopt to minimize cross-validation loss. Distance functions 'chebychev', 'euclidean', and 'minkowski'. For reproducibility, set the random seed, set the partition, and set the AcquisitionFunctionName option to 'expected-improvement-plus'. Set options give no iterative display. A coupled constraint is one that can be evaluated only by evaluating the objective function. In this case, the objective function is the cross-validated loss of an SVM model. The coupled constraint is that the number of support vectors is no more than 100. The model details are in Optimize a Cross-Validated SVM Classifier Using bayesopt. Create the data for classification. The objective function is the cross-validation loss of the SVM model for partition c. The coupled constraint is the number of support vectors minus 100.5. This ensures that 100 support vectors give a negative constraint value, but 101 support vectors give a positive value. The model has 200 data points, so the coupled constraint values range from -99.5 (there is always at least one support vector) to 99.5. Positive values mean the constraint is not satisfied. Set the NumCoupledConstraints to 1 so the optimizer knows that there is a coupled constraint. Set options to plot the constraint model. Most points lead to an infeasible number of support vectors. Improve the speed of a Bayesian optimization by using parallel objective function evaluation. Prepare variables and the objective function for Bayesian optimization. The objective function is the cross-validation error rate for the ionosphere data, a binary classification problem. Use fitcsvm as the classifier, with BoxConstraint and KernelScale as the parameters to optimize. Search for the parameters that give the lowest cross-validation error by using parallel Bayesian optimization. Done copying objective function to workers. Total elapsed time: 38.2851 seconds. Return the best feasible point in the Bayesian model results by using the bestPoint function. Use the default criterion min-visited-upper-confidence-interval, which determines the best feasible point as the visited point that minimizes an upper confidence interval on the objective function value. The table zbest contains the optimal estimated values for the 'BoxConstraint' and 'KernelScale' name-value pair arguments. 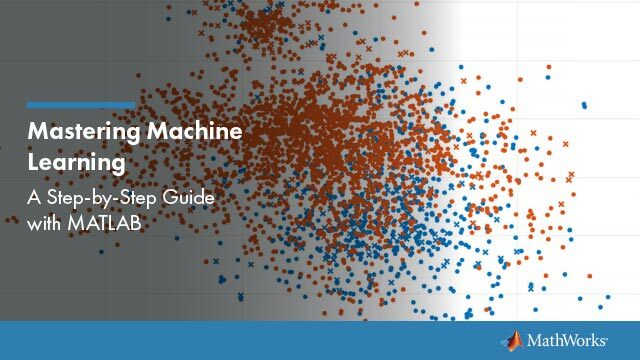 Use these values to train a new optimized classifier. Observe that the optimal parameters are in Mdl. fun accepts x, a 1-by-D table of variable values, and returns objective, a real scalar representing the objective function value fun(x). constraints, a real vector of coupled constraint violations. For a definition, see Coupled Constraints. constraint(j) > 0 means constraint j is violated. constraint(j) < 0 means constraint j is satisfied. UserData, an entity of any type (such as a scalar, matrix, structure, or object). For an example of a custom plot function that uses UserData, see Create a Custom Plot Function. For details about using parallel.pool.Constant with bayesopt, see Placing the Objective Function on Workers. Variable descriptions, specified as a vector of optimizableVariable objects defining the hyperparameters to be tuned. Specify optional comma-separated pairs of Name,Value arguments. Name is the argument name and Value is the corresponding value. Name must appear inside quotes. You can specify several name and value pair arguments in any order as Name1,Value1,...,NameN,ValueN. Function to choose next evaluation point, specified as one of the listed choices. Acquisition functions whose names include per-second do not yield reproducible results because the optimization depends on the runtime of the objective function. Acquisition functions whose names include plus modify their behavior when they are overexploiting an area. For more details, see Acquisition Function Types. Specify deterministic objective function, specified as false or true. If fun is stochastic (that is, fun(x) can return different values for the same x), then set IsObjectiveDeterministic to false. In this case, bayesopt estimates a noise level during optimization. Propensity to explore, specified as a positive real. Applies to the 'expected-improvement-plus' and 'expected-improvement-per-second-plus' acquisition functions. See Plus. Fit Gaussian Process model to GPActiveSetSize or fewer points, specified as a positive integer. When bayesopt has visited more than GPActiveSetSize points, subsequent iterations that use a GP model fit the model to GPActiveSetSize points. bayesopt chooses points uniformly at random without replacement among visited points. Using fewer points leads to faster GP model fitting, at the expense of possibly less accurate fitting. Compute in parallel, specified as false (do not compute in parallel) or true (compute in parallel). bayesopt performs parallel objective function evaluations concurrently on parallel workers. For algorithmic details, see Parallel Bayesian Optimization. Imputation method for parallel worker objective function values, specified as 'clipped-model-prediction', 'model-prediction', 'max-observed', or 'min-observed'. To generate a new point to evaluate, bayesopt fits a Gaussian process to all points, including the points being evaluated on workers. To fit the process, bayesopt imputes objective function values for the points that are currently on workers. ParallelMethod specifies the method used for imputation. 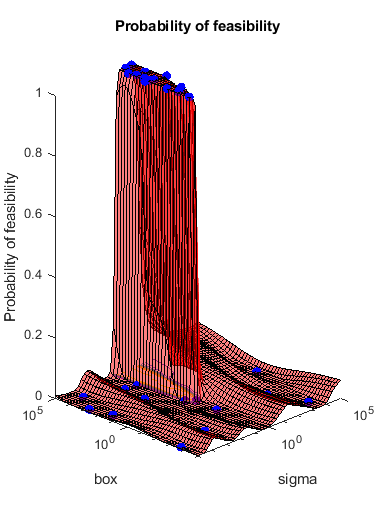 'model-prediction' — Impute the mean Gaussian process prediction at the point x. 'max-observed' — Impute the maximum observed objective function value among feasible points. 'min-observed' — Impute the minimum observed objective function value among feasible points. Tolerance on the number of active parallel workers, specified as a positive integer. After bayesopt assigns a point to evaluate, and before it computes a new point to assign, it checks whether fewer than MinWorkerUtilization workers are active. If so, bayesopt assigns random points within bounds to all available workers. Otherwise, bayesopt calculates the best point for one worker. bayesopt creates random points much faster than fitted points, so this behavior leads to higher utilization of workers, at the cost of possibly poorer points. For details, see Parallel Bayesian Optimization. Objective function evaluation limit, specified as a positive integer. Time limit, specified as a positive real. The time limit is in seconds, as measured by tic and toc. Run time can exceed MaxTime because bayesopt does not interrupt function evaluations. Number of initial evaluation points, specified as a positive integer. bayesopt chooses these points randomly within the variable bounds, according to the setting of the Transform setting for each variable (uniform for 'none', logarithmically spaced for 'log'). Deterministic constraints on variables, specified as a function handle. For details, see Deterministic Constraints — XConstraintFcn. Conditional variable constraints, specified as a function handle. For details, see Conditional Constraints — ConditionalVariableFcn. Number of coupled constraints, specified as a positive integer. For details, see Coupled Constraints. NumCoupledConstraints is required when you have coupled constraints. Indication of whether coupled constraints are deterministic, specified as a logical vector of length NumCoupledConstraints. For details, see Coupled Constraints. Command-line display level, specified as 0, 1, or 2. 0 — No command-line display. 1 — At each iteration, display the iteration number, result report (see the next paragraph), objective function model, objective function evaluation time, best (lowest) observed objective function value, best (lowest) estimated objective function value, and the observed constraint values (if any). When optimizing in parallel, the display also includes a column showing the number of active workers, counted after assigning a job to the next worker. Accept — The objective function returns a finite value, and all constraints are satisfied. Best — Constraints are satisfied, and the objective function returns the lowest value among feasible points. Error — The objective function returns a value that is not a finite real scalar. Infeas — At least one constraint is violated. 2 — Same as 1, adding diagnostic information such as time to select the next point, model fitting time, indication that "plus" acquisition functions declare overexploiting, and parallel workers are being assigned to random points due to low parallel utilization. Function called after each iteration, specified as a function handle or cell array of function handles. An output function can halt the solver, and can perform arbitrary calculations, including creating variables or plotting. Specify several output functions using a cell array of function handles. @assignInBase — Constructs a BayesianOptimization instance at each iteration and assigns it to a variable in the base workspace. Choose a variable name using the SaveVariableName name-value pair. @saveToFile — Constructs a BayesianOptimization instance at each iteration and saves it to a file in the current folder. Choose a file name using the SaveFileName name-value pair. You can write your own output functions. For details, see Bayesian Optimization Output Functions. File name for the @saveToFile output function, specified as a character vector or string scalar. The file name can include a path, such as '../optimizations/September2.mat'. Variable name for the @assignInBase output function, specified as a character vector or string scalar. Plot function called after each iteration, specified as 'all', a function handle, or a cell array of function handles. A plot function can halt the solver, and can perform arbitrary calculations, including creating variables, in addition to plotting. Specify no plot function as . 'all' calls all built-in plot functions. Specify several plot functions using a cell array of function handles. The built-in plot functions appear in the following tables. 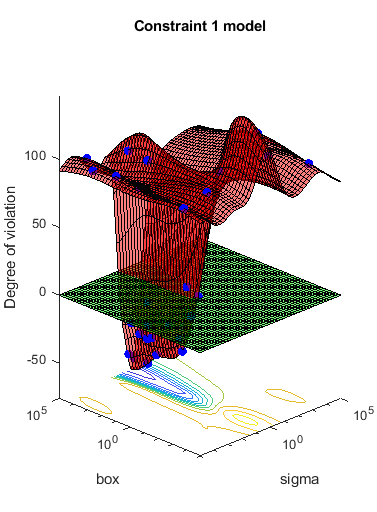 Plot the acquisition function surface. Plot each constraint model surface. Negative values indicate feasible points. Also plot a P(feasible) surface. Plotted error = 2*Probability(error) – 1. 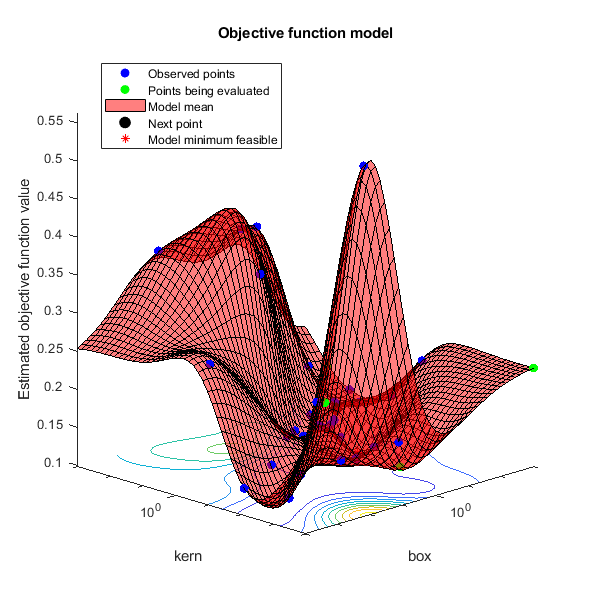 Plot the objective function evaluation time model surface. 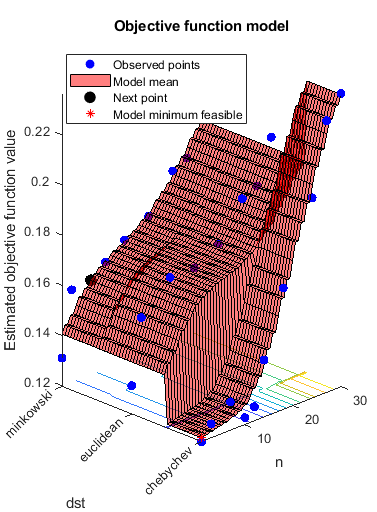 Plot the fun model surface, the estimated location of the minimum, and the location of the next proposed point to evaluate. For one-dimensional problems, plot envelopes one credible interval above and below the mean function, and envelopes one noise standard deviation above and below the mean. 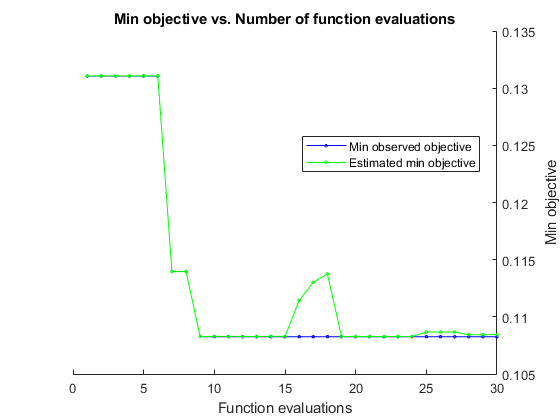 Plot each observed function value versus the number of function evaluations. 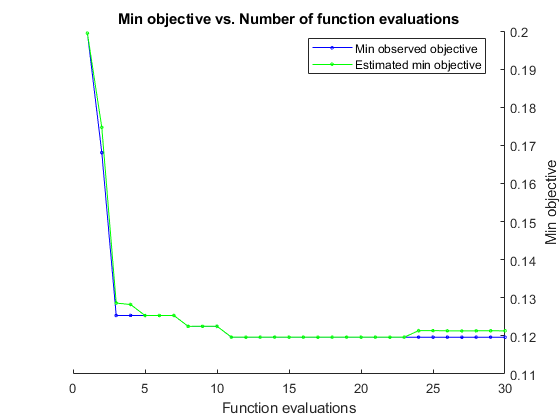 Plot each observed function evaluation run time versus the number of function evaluations. 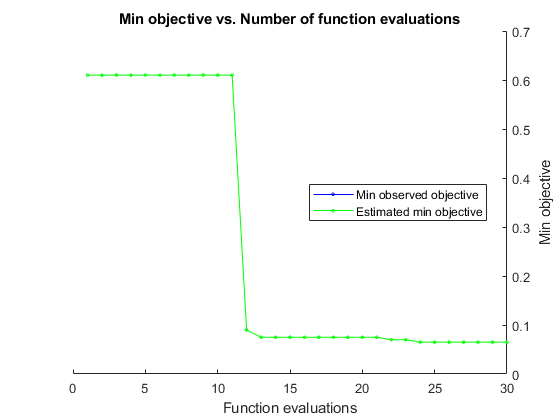 Plot the minimum observed and estimated function values versus the number of function evaluations. Plot three curves: the total elapsed time of the optimization, the total function evaluation time, and the total modeling and point selection time, all versus the number of function evaluations. You can write your own plot functions. For details, see Bayesian Optimization Plot Functions. A minimum objective plot can increase. The optimization can declare a problem infeasible even when it showed an earlier feasible point. The reason for this behavior is that the decision about whether a point is feasible can change as the optimization progresses. bayesopt determines feasibility with respect to its constraint model, and this model changes as bayesopt evaluates points. So a “minimum objective” plot can increase when the minimal point is later deemed infeasible, and the iterative display can show a feasible point that is later deemed infeasible. Initial evaluation points, specified as an N-by-D table, where N is the number of evaluation points, and D is the number of variables. If only InitialX is provided, it is interpreted as initial points to evaluate. The objective function is evaluated at InitialX. If any other initialization parameters are also provided, InitialX is interpreted as prior function evaluation data. The objective function is not evaluated. Any missing values are set to NaN. Objective values corresponding to InitialX, specified as a length-N vector, where N is the number of evaluation points. Constraint violations of coupled constraints, specified as an N-by-K matrix, where N is the number of evaluation points and K is the number of coupled constraints. For details, see Coupled Constraints. Errors for InitialX, specified as a length-N vector with entries -1 or 1, where N is the number of evaluation points. Specify -1 for no error, and 1 for an error. Initial data corresponding to InitialX, specified as a length-N cell vector, where N is the number of evaluation points. Evaluation times of objective function at InitialX, specified as a length-N vector, where N is the number of evaluation points. Time is measured in seconds. Times for the first N iterations, specified as a length-N vector, where N is the number of evaluation points. Time is measured in seconds. Bayesian optimization results, returned as a BayesianOptimization object. Coupled constraints are those constraints whose value comes from the objective function calculation. See Coupled Constraints. Accelerate code by automatically running computation in parallel using Parallel Computing Toolbox™. To run in parallel, set the 'UseParallel' option to true. Set the 'UseParallel',true name-value pair argument in the call to this function. For more general information about parallel computing, see Run MATLAB Functions with Automatic Parallel Support (Parallel Computing Toolbox).